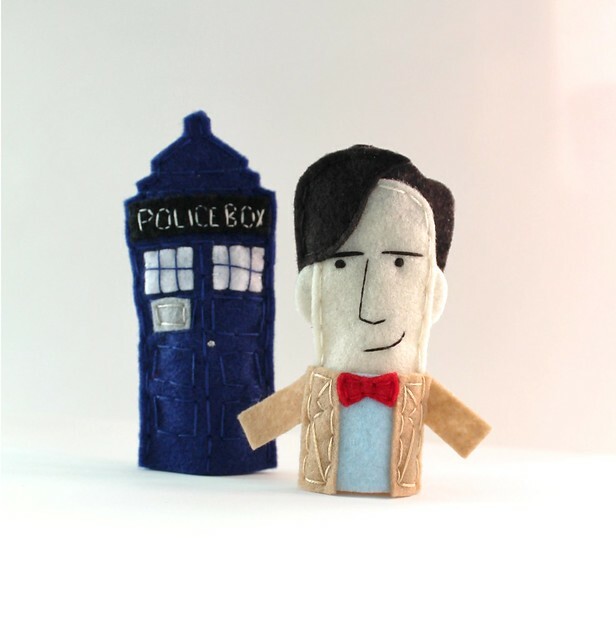 Now that the holidays are over, I can finally share the set of Dr. Who finger puppets I made for my nephew this year. He sat with me at my booth this summer at the Indieana Handicraft Exchange and was quite insistent that I should be making a Matt Smith puppet as part of my collection. I explained that if I make a puppet for a show I don’t watch, I’ll just end up in a bunch of awkward conversations (“Oh yeah, I totally remember that one time where that person did that, uh, funny thing.”), but did agree that a custom set just for him was probably do-able. So I finally relented and gave these for Christmas. I did some reconnaissance with my sister-in-law and found out that his other two fave characters were Rory and Amy, so the complete set also included them, but the Tardis and Doctor were my favorite parts. It seems appropriate to be making Noah basically whatever puppets he wants, since he was the original inspiration for me making them to begin with– it was for his birthday in 2006 that I made my very first animal designs that led down this puppet-crazy road. Pretty amazing how things can come full circle, huh?